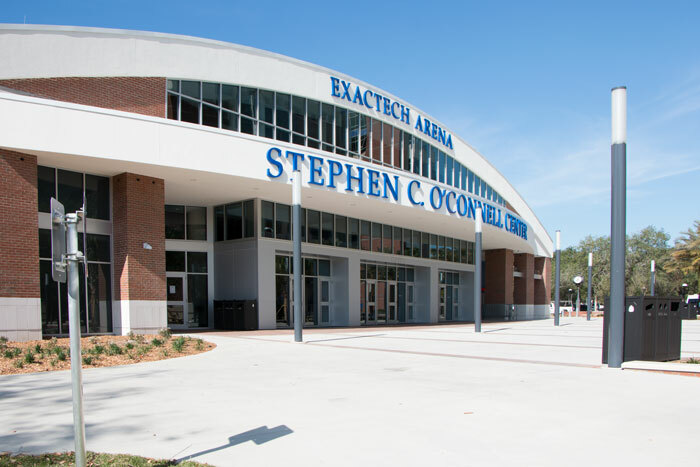 BCI Integrated Solutions was part of the University of Florida’s renovation of the Stephen C. O’Connell Center, where they host their basketball, gymnastics, swimming, and volleyball events, among others. 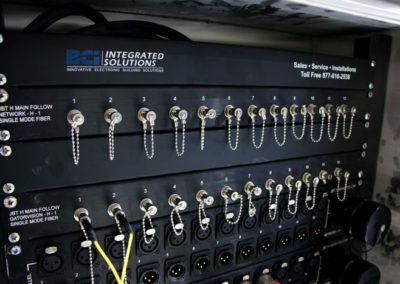 BCI installed two systems we have years of experience in, covering a complete bowl sound system to cover all audience seats, under scoreboard speakers to cover the court and floor area, concourse speakers for general areas, as well as a broadcast cabling system to provide media trucks to live stream events. 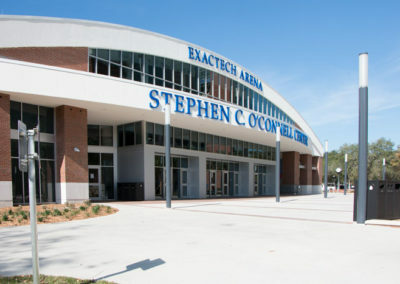 The sound system for the Stephen C. O’Connell center was designed with the attendees in mind. BCI is installing 8 of EAW’s latest point source speakers. These 8 EAW QX500 speaker clusters will be installed all along the bowl in order to distribute the sound equally throughout, making every seat perfect for sound. 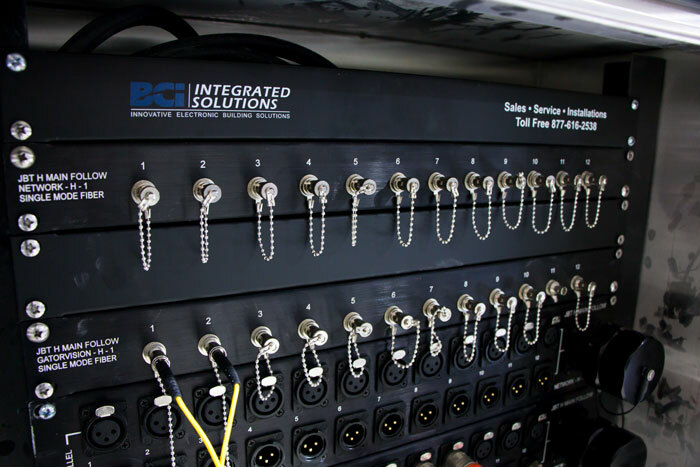 BCI will be providing all of the rigging for the main speaker clusters, including chain hoists to enable the speakers to be lowered for service. We also installed speakers beneath the scoreboard to cover the floor of the arena and not missing those court side seats. 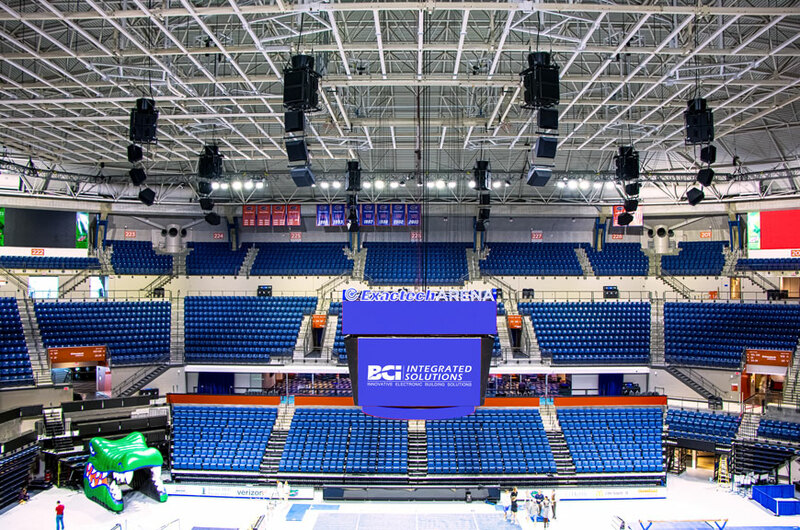 On the upper bowl, delay speakers will be installed to cover the sound beyond the main clusters, creating a connected sound system throughout the inside of the arena. 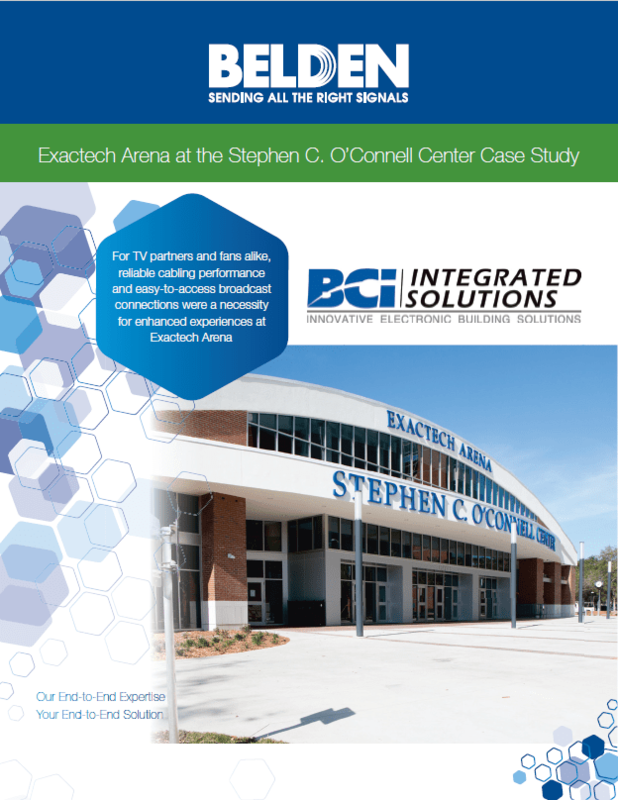 Along with speakers inside of the main arena, BCI installed perimeter speakers within the public concourse areas allowing everyone in the O’Connell center to be connected to the event inside at all times. 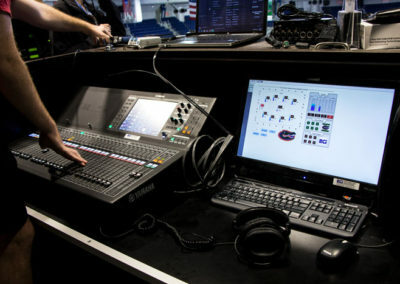 For the fans not lucky enough to attend the events at UF, we are installing a broadcast cabling system for the connection of media trucks to distribute live to local and national sports networks. 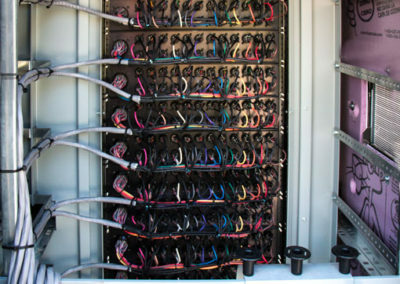 We used Triax cabling for cameras and fiber to each location. 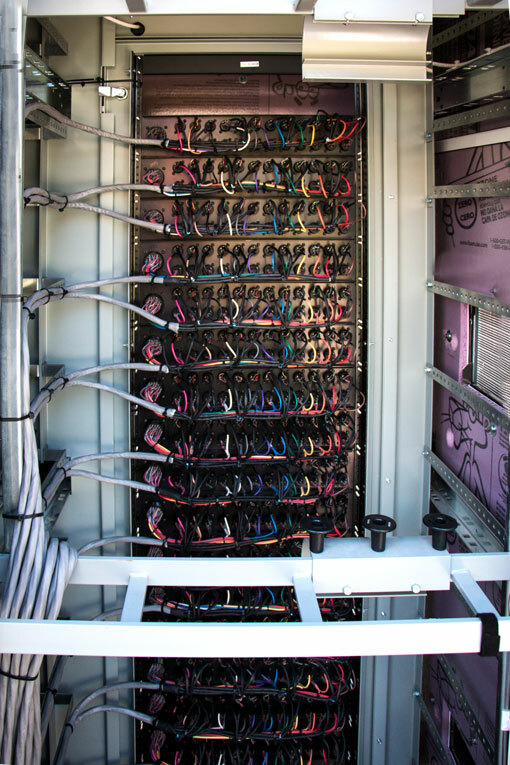 This cabling system is terminated in stainless steel outdoor racks, ready for connection to broadcast trucks. 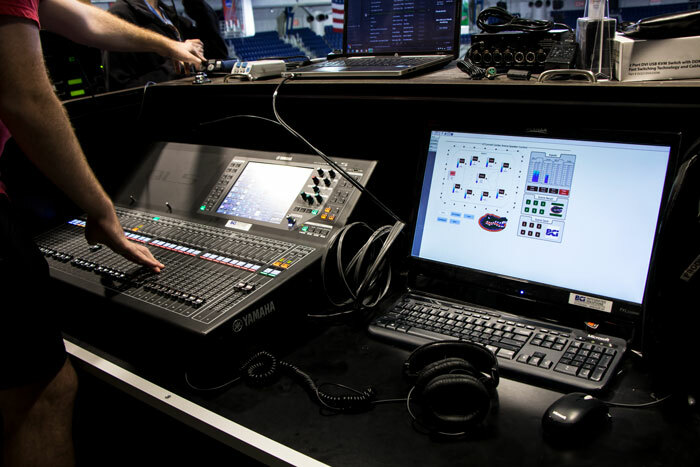 This system makes a seamless process for any broadcast truck to work with and get the game/event to fans across the nation.